The town of Zaporozhye, Zaporozh'e (Zaporizhzhya, in Ukrainian) is more 200 years old and is situated about 600 km South-East of Kiev - Ukraine's capital - and half-way between the fields of iron ore in Krivoi Rog to the Westand the coal in the Donetsk basin to the East. The town is built on the wide plains along both banks of the mighty and ancient Dniepr River, which gives Zaporozhye a unique atmosphere. The residential areas of Zaporozhye are very spacious with plenty of light and greenery, and the streets crossing Lenin Prospekt - the longest road - slant down towardsthe Dnieper River. The town stretches out for over 30 kilometers along the river, and in its width the new residential districts extend for 25 kilometers. A most remarkable sight and the pride of Zaporozhye's citizens is Khortitsa Island, which is the custodian of anantiquity reserve#museum and a nature reserve popular with weekend visitors. Railways, highways, airlines and water-ways connect Zaporozhye with Moscow, Kiev, Kharkov, Poltava, Simferopol and many other cities and towns in our country. Just beyond the borders of the town to the South, you can find the vaste Kakhovsky Reservoir, which is often called a sea, and the Sea of Azov - a very popular health-resort area - lies about 150-200 kilometers further towards the South. 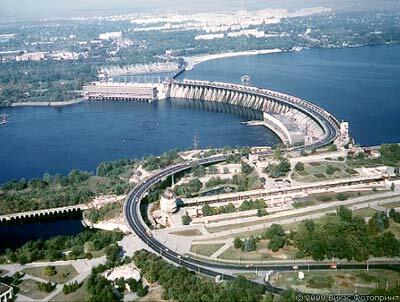 Kakhovsky Reservoir finally flows into the Black Sea close to Odessa, one of Ukraine's major ports. You can travel all of the wayfrom Kiev to Odessa by boat on the Ukrainian Waterways. Historians and archaeologists tell us that the territory of Zaporozhye had been inhabited by people from time immemorial. This is shown for example by stone tools of the Late Paleolithic Age (about 15 thousand years ago), two settlements of the Heolithic Age (6th millennium B.C. ), objects of material culture of the Late Bronze Epoch (Ist.millennium B.C). Both the Scythians (4th millennium B.C ) and the Samatians (2nd centuryB.C.- 2nd century A.D.) lived here, while in the 9th-13th centuries the area was already heavily populated by Slavs, which is shown by the remains of 57 Slavonic settlements which were discovered near the Dneproges Hydroelectric Dam. However, according to the historians, most of the Slav dwellers left this area in the 13th century, running awayfrom the Golden Horde invasion, and by the end of the 15th century and the beginning ofthe 16th century, Zaporozhye Cossacks became masters of the lands beyond the rapids of the Dnieper River. The impregnable Khortitsa Island became one of the centers of Cossack civilization, and became a mighty force for the Ukrainian people in the struggle against foreign invaders and the feudal yoke and for the reunion of the Ukraine with Russia. But the town itself was founded much later, during a period of united straddle of the fraternal peoples against the Turkish Sultanate. Its origins go back to the end of 1770,when one of the fortresses of the Dnieper fortified line was built at the mouth of the Mokraya Moskovka. Zaporozhye was originally named Alexandrovsk after the commander of thefirst Russian Army, Prince Alexander Golitsyn. The builders, a battalion of Russian soldiers and toilers "lopatniki" (#slovellers) who had come here with their families became the first settlers of the future town. Among them were also Zaporozhye Cossacks, who founded a large village nearby after the abolition of the Zaporozhskaya Sechin 1775. Initially, the settlement grew up very slowly. Plague, epidemics and wartime hardships had a negative effect on its development. At that time, the people were mainly occupied in raising cattle, farming, growing vegetables, hunting and fishing. Handicraft and trade were poorly developed. The Dnieper fortified line lost its military significance following the victory over the Turkish Sultanate and the annexation of the Crimean Khanate to Russia in 1783, and the fortress was turned into a possad (trading quarter in the suburbs of a settlement). Since 1785 it was called Alexandrovsk, and some administrative offices appeared here at that time. In 1802 the town was included into Ekaterinoslav Province and in 1806 became a district town. Present-day Zaporozhye has over 1 million inhabitants and is the centre of a range of industries and the home to Zaporozhye State University. 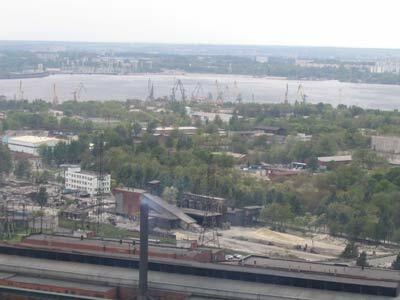 We'll refer to some figures to illustrate the present industrial strength of Zaporozhye: It now produces nearly half of the stainless steel and ball-bearing steel in the country, a third of the cold-rolled steel sheets and about half of the transformers. It is the first domestic producer of the "Zaporozhyets" mini-car, and manufactures products from titanium, aluminum, ferroalloys etc.... About 400 different products are being exported by the town's enterprises to more than seventy foreign countries. In Zaporozhye there are now over 100 secondary schools, 14 professional schools, a university, three institutes, 13 technical secondary schools, two medical schools, two pedagogical institutes and a musical colleges, about 30 scientific research and design institutions. Every fourth inhabitant is a scholar. The community now has access to over 400 libraries, more than 50 cinemas, a Musical and Drama Theater, the Theater of Young Spectators and a Puppet Theater, a concert hall, a circus, 46 Palaces of Culture andvarious evening clubs. The scientific community of the city encompasses more than 600 doctors and professors.Over 220 members of creative unions (writers, journalists and artists) live and work heretoo. Zaporozhye has become a city of more than 1300 avenues, streets, side-streets and squares located in six administrative districts (Leninsky, Zavodskoi, Orjonikidzevsky,Zhovtnevy, Kommunarsky and Shevchenkovsky) with the population of over one million. A child is born here every 48 minutes. There are now 270 medical establishments in Zaporozhye with more than two thousand doctors working there. The tram, trolley-bus and motorbus routes are over 1000 km long. There are some 30 parks and public gardens, the total area of greenery of which covers 12,500 hectares- an average of 17 square meter's of greenery per inhabitant. The city has many true friends abroad, such as the twin-towns of Vrotslav and Legnitsa (Poland), Obrovats (Yugoslavia), Lakhti (Finland), Birmingham (England), Belfor (France) and Linz (Austria), Oberhausen (Germany). Delegations from these towns often come to visit the city and enjoy the hospitality of our residents. Port city in Zaporizhzhya Oblast, southeastern Ukraine. Berdyans'k is located 160 km (99 mi) southwest of Donets'k. It lies on a small peninsula on the northern coast of the Sea of Azov, in a semiarid plain. Founded in 1827, it was called Osipenko from 1939 to 1958. German forces occupied the city for several months during World War II (1939-1945). A coastal health resort is nearby. Population (1996 estimate) 135,000. City in southern Ukraine, in the southern part of Zaporizhzhya Oblast, on the Molochnaya River. Melitopol' is about 100 km (about 60 mi) south of Zaporizhzhya, in a steppe region where vegetables, grapes, and other fruits are grown. The city serves as a regional and manufacturing center. Products include automobile engines, tractor parts, refrigerators, food products, and consumer goods. In Melitopol' are the Melitopol' Institute of Agricultural Mechanization (founded in 1930), the Melitopol' Pedagogical Institute (1922) and a regional museum. Nearby is the Melitopol'kurhan, a royal burial mound of the Scythians from the 4th century BC, excavated in 1954. The settlement was founded in 1784 as Novooleksandrivka (in Russian, Novo-Aleksandrovka), but renamed Melitopol' in 1841. In Ukrainian, it is also spelled Melitopil'. Population (1996 estimate) 174,000.